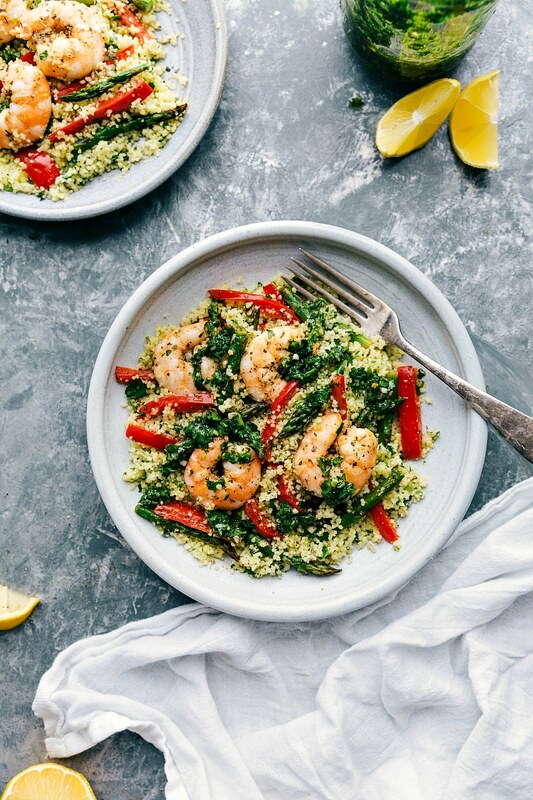 Simple and deliciously seasoned shrimp couscous roasted on a single sheet pan with asparagus and red pepper. This 30-minute dinner is topped with an addictive green herb sauce! This meal hits all the bases — it’s healthy, flavor packed, and simple to make. Pair this shrimp couscous with this easy cucumber salad or a quick fruit salad. It’s beginning to feel like Spring where I’m at which means it’s time to break out the asparagus! 🙂 We had this roasted asparagus a couple of times this week which is one of our favorites! So with about 1/2 pound asparagus leftover and a red bell pepper that needed to be used in the fridge, this shrimp couscous was born. 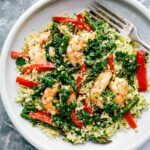 This shrimp couscous is a quick meal to make and feels like Spring on a plate! It’s light, flavorful, and nutritious. 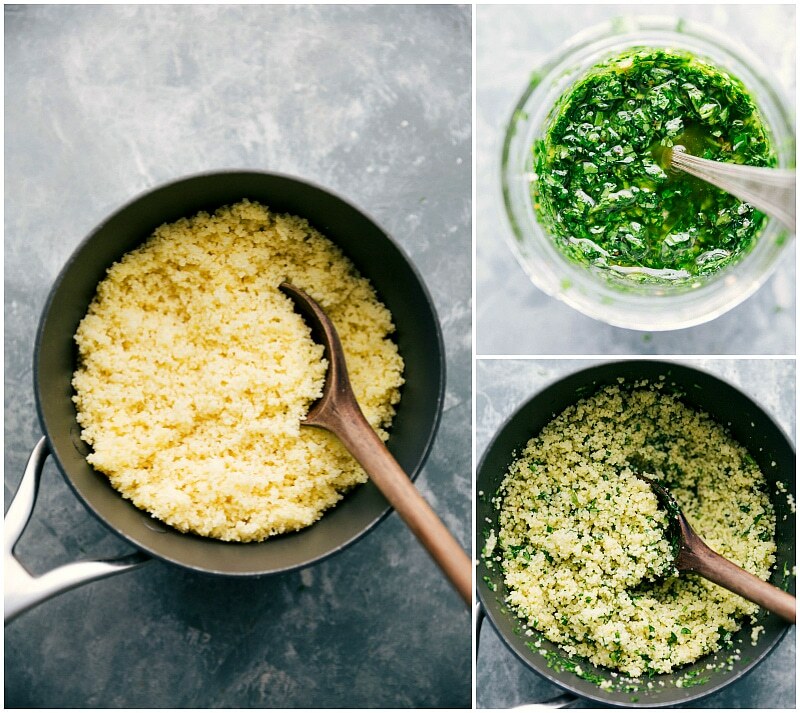 Start with the green herb sauce: the longer this sauce has to “marinate” in the fridge, the more flavorful it becomes. Roast the veggies and shrimp: the asparagus and red bell pepper are roasted first and then the shrimp gets added on the tray. It’s a great way to save dishes and total cook time is less than 15 minutes! Prepare the couscous: while the veggies and shrimp are cooking, prepare the couscous. If you haven’t you’re going to LOVE how easy it is to prepare. See how to make it here. 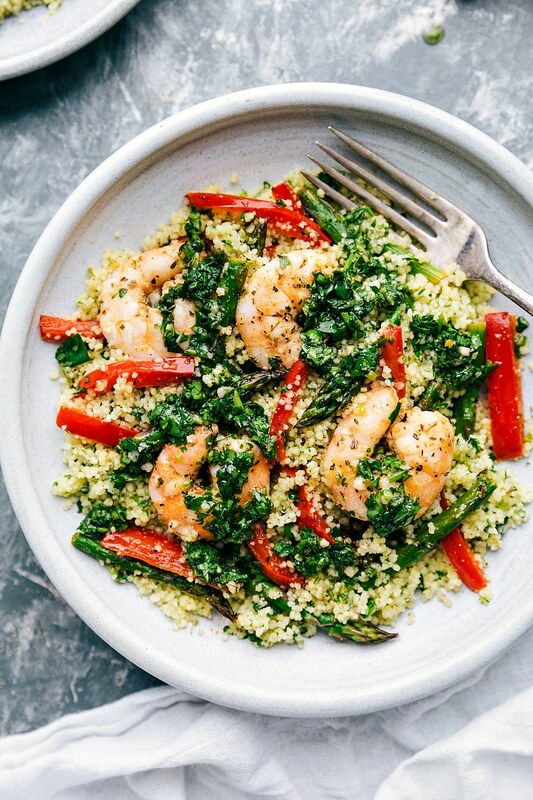 Assemble: toss some of the addictive green herb sauce in the couscous, add the roasted shrimp & veggies on top, and drizzle with more of the sauce. Roasted asparagus is done when it’s turned bright green and is tender but still has a slight bite to it. You can pierce the spears with a fork or take a quick bite of one to gauge how cooked they are. 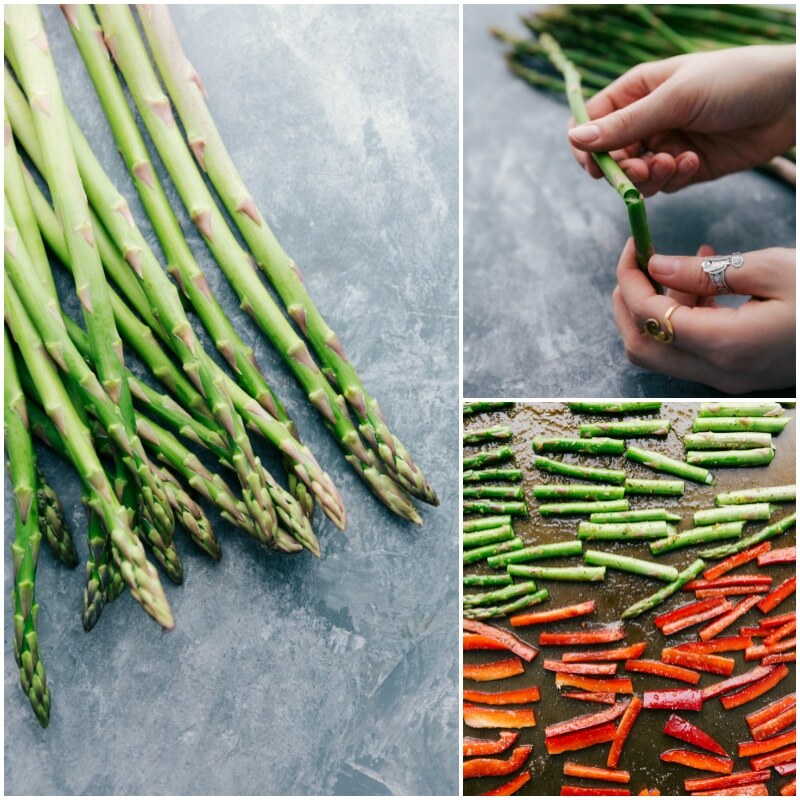 The same applies to red peppers 🙂 Make sure the peppers are very thinly sliced and then the slices are halved so they’ll be done at the same time the asparagus is. You’ll know the shrimp is done when it turns from blue-grey and translucent color to whitish-pink and opaque color. Use a LARGE sheet pan: the more space the vegetables and shrimp has (the less crowded they are) the better and more evenly they’ll roast. When vegetables are overlapping on a sheet pan, they end up steaming instead of roasting. 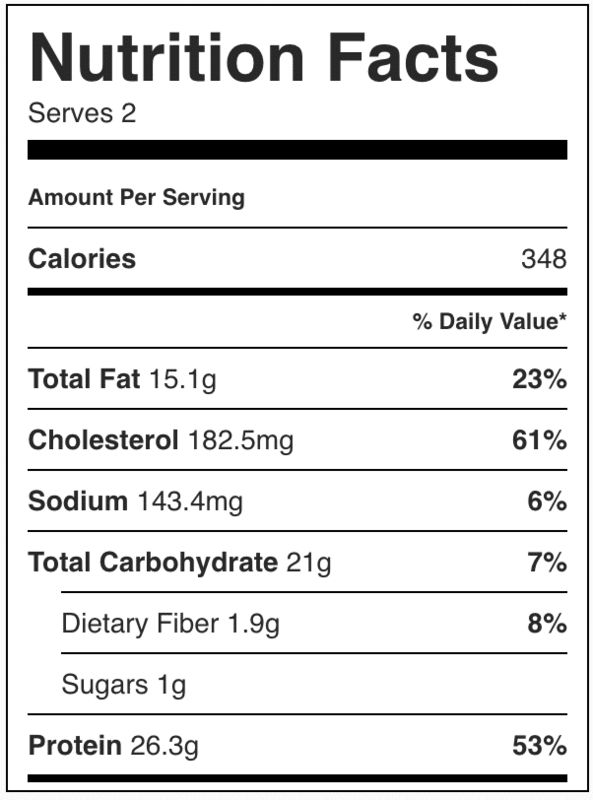 This definitely affects the end taste/texture. I’ve started using this 15×21 inch sheet pan. Using a huge sheet pan makes a big difference for this recipe. The actual thickness of asparagus varies, the size of your shrimp will vary, and your actual oven temperature can vary. For best practice, check the roasted vegetables and shrimp rather than relying solely on a time. (The time will also vary depending on how roasted you like your vegetables. We like ours crisp tender (still has a slight bite to it). If you like your veggies more well done, add a few minutes to the vegetable roasting time. Simple and deliciously seasoned shrimp couscous roasted on a single sheet pan with asparagus and red pepper. This meal is topped with an addictive green herb sauce! HERB SAUCE: Start with the sauce so it has a chance for the flavors to meld; this sauce can be made 1-2 days in advance. In a large mason jar, add 1/2 cup olive oil, 1 teaspoon Italian seasoning, red wine vinegar, honey, and 2 tablespoons lemon juice. Finely chop garlic (3 cloves (or less) if sensitive to garlic and 4 cloves for garlic lover!). Add in the garlic to the jar and shake well to combine ingredients. Finely chop a bunch of parsley to get a full 1/2 cup (you should use most if not all of a good sized bunch; simply cut off the bottom of the entire bunch and chop the rest). Finely chop the cilantro. Add the finely chopped parsley and cilantro to the jar and stir to combine. Place the lid on the jar and place in the fridge to "marinate" while preparing the rest of the dish. VEGGIES/SHRIMP: Preheat the oven to 400 degrees F. On a large sheet pan, add the chopped asparagus (remove ends and then cut all the asparagus into 3 parts) and chopped red pepper (very thinly slice the entire pepper and cut those slices in half). In a small bowl, stir together 1 teaspoon salt, 1 teaspoon garlic powder, remaining 1 teaspoon Italian seasoning, 1/2 teaspoon cayenne pepper, remaining 2 tablespoons olive oil, and 1 tablespoon lemon juice. Stir to form a paste and add exactly half to the veggies. Toss well to coat and spread into 1 even layer so no veggies are overlapping. Place in the oven and cook for 6-7 minutes (this will vary on actual thickness of veggies). Meanwhile, prepare the shrimp. Pat the shrimp dry and gently toss in a bowl with remaining spice mix/paste. Remove veggies from the oven, toss, and allow room for the shrimp. 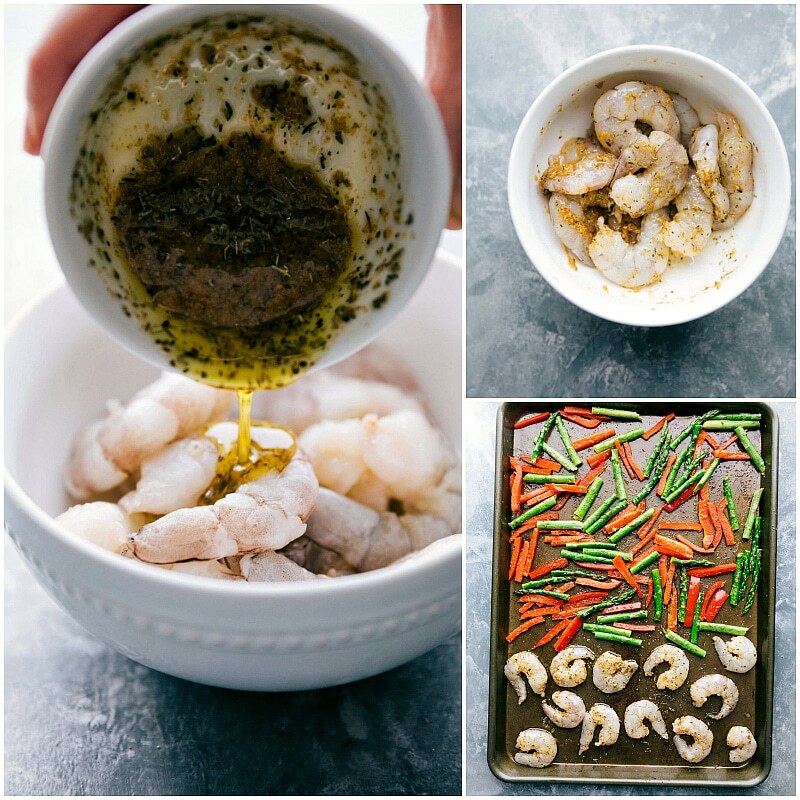 Add shrimp to sheet pan and cook for another 6-7 minutes or until shrimp is opaque and veggies are crisp tender. Remove. SERVE: Separate couscous onto 2 (or 4 - see Note 1) plates. Add equal amounts of veggies and equal amounts of shrimp. Serve with remaining herb sauce (add to taste; you may have some leftover!). Enjoy immediately.